Back in the sixties, something strange was taking place on the verandah of the St. Catherine Elementary building near the sea. The creative process of invention was being implemented as the long iron railing became the stretching barre as budding ballerinas did their plies. These young pre-teen and teenage girls were learning the basic technique and exercises of classical Ballet under the critical eye of their dance mistress. That time was the beginning of what became the lifelong contribution to Belizean dance, culture and growth. 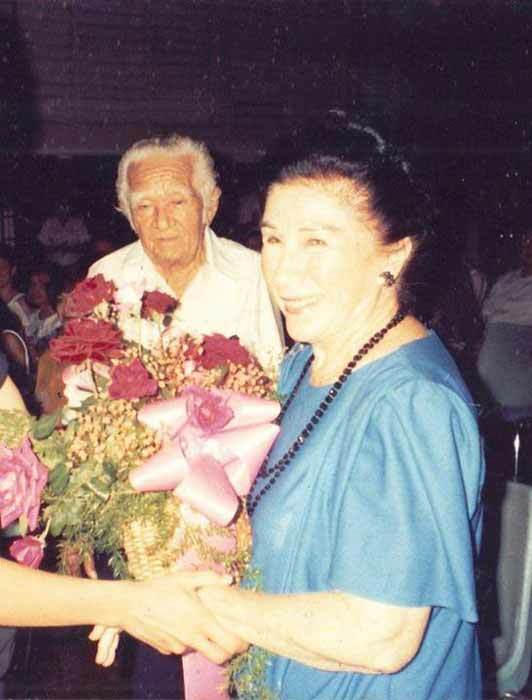 Mrs. Mary Valdes, with her vivid imagination, commitment to excellence and positive attitude, taught dancing to girls whose physical growth was paralleled by the spiritual and ethical values of honesty, integrity, sharing, and love for fellow human beings. In pre-Independent Belize, the Mary Valdes School of Dance contributed through its director and choreographer to the arts and to growing nationalism. In learning to dance and perform on stage Mrs. Valdes' dancers grew in poise and self-confidence as their teacher proved her love for and support of the fine arts. Her participation in the Epic of Belize for many years along with Ronald Clarke became a mainstay of September celebrations with the girls performing Meztizada, Hoo-say-me-say, and Maya, Creole and Garifuna dances. Later on at her own home on Prince Street which became our studio, her special ability to build upon each dancer’s unique capabilities, to choreograph in such a way that highlighted every girl’s strengths made us each feel so very special. She transported us to the world of magic in various performances such as Swan Lake, the Nutcracker, Sleeping Beauty, Giselle and others. In the time before television and dance camps, Mrs. Valdes called upon her inner creative resources to prepare and present pageantry which still holds a special place in the hearts of all those whose lives she has touched. Mrs. Valdes is a giant in the memory of those who were privileged to have been a part of that magical world. As we pay tribute to the unique talent of a wonderful lady, let us join in thanking her for her wonderful example. Mrs. Valdes' dedication to the promotion of the arts in the developing nation of Belize is exemplary. Her patience and soft-spoken demeanor yet strong presence have given us the courage to live our lives with confidence. We continue to treasure her guidance and encouragement to bring out the best in each and every performance. Curtains! Lights! The show will go on!"